Is Colombia’s Duque Another Macron, or Another Medvedev? 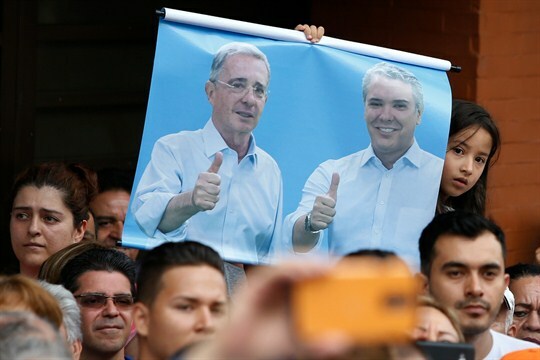 A poster of Colombia’s former president, Alvaro Uribe, and the new president-elect, Ivan Duque, during a campaign rally, Armenia, Colombia, June 10, 2018 (AP photo by Fernando Vergara). Last Sunday, Colombians elected their next president in a second round run-off, delivering a strong victory for the conservative candidate, Ivan Duque, as the polls had predicted. That the outcome was largely expected in no way diminishes the historic significance of the election, and it does nothing to ease the complexity of the challenge facing the man some are calling Colombia’s Emmanuel Macron, a young, little-known figure who rose from relative obscurity, vowing to bring change.